Project Q: BGHS & MHS Team up. 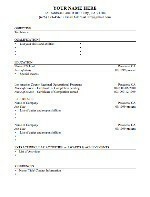 Need help putting together your resume? Click on the pictures below to view a resume template, resume tips and more! If you would like more help or would like your resume reviewed, come visit me, your ROP Counselor, in the Career Center. As an applicant, when you interview for a job, think of yourself as a salesperson and think of the employer as a potential customer. Your mission, as an applicant, is to sell to the employer that you are the best choice for the job. One way to sell (convince someone to make a decision in your favor) is to demonstrate how your experience, skills and abilities can satisfy the employer’s needs. To Find A Career That Fits You Click Above!